Pull yourself together, it's time to ride the Pair of Kirtons 600! 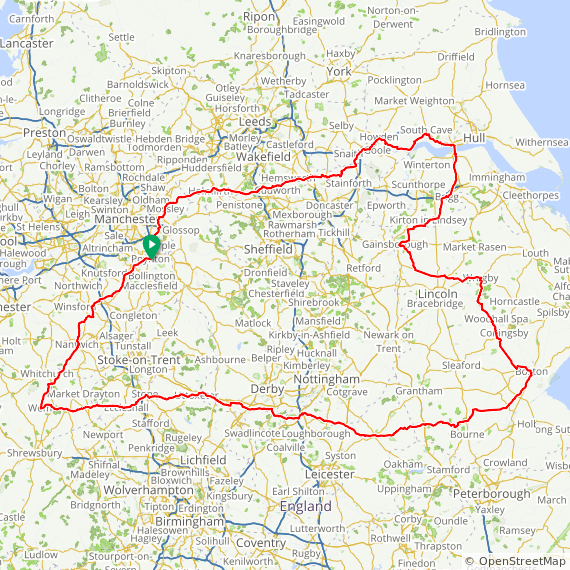 Ride through both Kirton in Lindsey and Kirton near Boston for your 2019 Super Randonneur and PBP qualification. We start from Poynton (near Stockport), where we have a Church Hall available from the Friday evening, and we'll have some airbeds so you can be fresh and ready for a 6am start. There is an early climb of the Pennines at Saddleworth, but it's then flat all the way across Yorkshire and Lincolnshire, via the Humber Bridge. There are a few irritating lumps after Uttoxeter, but these are soon dealt with for an easy finish via Wem and Prees Heath. We have luxury accommodation (by Audax standards) awaiting you at Corby Glen, at about 350km. We anticipate riders arriving around midnight (give or take a couple of hours) and we'll have hot food and drinks for you. More importantly, we'll have the LEL airbeds , so you should be able to grab a few hours of shut-eye. Bring an eye-mask and ear-plugs! You will need to leave before 6am in order to reach the next control before it closes. The approach roads to the motorway services at Donington shouldn't be too busy at the time you are expected here, where you can enjoy a Harvester breakfast from 7am, or before that, grab a coffee from Costa. Return to the start through Stone, Wem and Prees Heath for a stop at the Raven cafe. There is no drop-bag facility, nor anywhere to leave stuff at the start/finish, so you need to carry everything with you. Need somewhere to stay before or after the ride? Try the Travelodge at Adlington, or perhaps a budget hotel at nearby Manchester Airport. There is a Camping/caravan site in Higher Poynton. You will find a Youth Hostel in Central Manchester.